Is Vishal and Mysskin teaming up? Suriya, Vishal, Prabhas and Nivin Pauly to join hands for Vikram! This is going to be huge from Director Bala !!! Vishal and Radha Ravi send us a shocker! Vishal - "I will deal with the controversy soon!" Vishal - "We will announce very soon"
Vishal - "Kamal Sir agreed to be a Trustee"
Sarathkumar - "Baseless accusations and allegations have deeply hurt me"
This page hosts a weekly slideshow related to Tamil movies. Each slide includes a picture and some description about that picture. All the slides will have a recurring theme. People looking for actress stills, actress images, actor stills, actor images, movie stills, movie images, and other interesting topics, relevant issues in Tamil cinema will find this page useful. 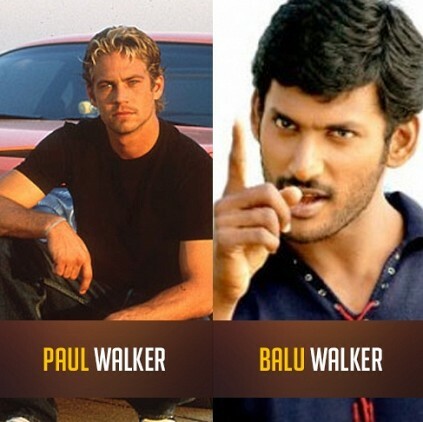 Paul Walker - Balu walker | Hollywood names for our K-Town characters.